Austin Beutner’s first day on the job as LA Unified’s superintendent is going to be a long day of listening and learning. 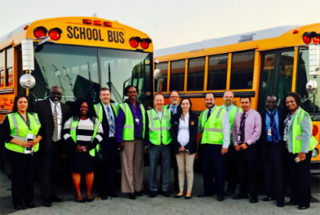 He starts before dawn Tuesday at a bus yard and ends with an evening parent meeting. But he’s also intent on helping parents and the greater Los Angeles community learn about the behemoth that is LA Unified. And he’s starting with maybe the biggest nut of all: the budget. Last week and again Monday, Beutner met with Chief Financial Officer Scott Price and Communications Director Shannon Haber. The three of them are the beginnings of an informal internal task force with the goal of simplifying the budget conversation and bringing transparency to the district’s finances. The group will expand to include parents and other stakeholders but will work quickly to draft ways to help the public understand what’s in the piggy bank, how sound the financial future looks, and what all the jargon means. They plan to include a high school math teacher, someone skilled at taking complex numbers “and conveying it to a 10th-grader. There are a lot of people who do that professionally very, very well,” Beutner told LA School Report in an interview. “We’re going to try to figure out a way to communicate facts and figures and budgets in a way that the average listener, reader, or viewer of yours will comprehend,” he said. “We have to take what is known — it’s factually the same — but we have to find a way to convey it in a way” people can understand. So the jargon has to go. “Assigned reserves, what is a reserve? You decide to go to Cancun or not for vacation when you have money in the bank, savings. … Should we be going out to dinner tonight? What are our reserves? Beutner begins his first day at 5:15 at an LA Unified bus yard in Sun Valley and will be visiting schools and programs including a Spanish dual-language class at Grand View Boulevard Elementary School. He doesn’t speak Spanish, though his high school daughter does and is a dual-language learner. He will end the day at a parent meeting at Garfield High School. He’s getting a hall pass and will miss Tuesday’s Committee of the Whole meeting, which allows the school board members to discuss issues but not vote on them.